LOL! Oh I love when I'm late to my own party! Especially, when I'm really looking forward to this week's linky theme. Seriously, I've YET to find a marking tool that I like. I've used pencils, pens and even chalk...but no favorite yet. Lea Anne who blogs at Poduck Pretties wrote a helpful post last week that highlighted markers AND included a detailed variety of ways to get rid of a stubborn stain left behind! Arg! I think I would cry. I often use pencils to mark, but I recently have started using a Frixon 0.7 tip. I marked up an entire quilt top with the Frixon pen to cross hatch quilt it. When I was done, I ran and iron over and al the ink disappeared! Blue painters tape! Coincidentally, I have a blog post discussing this coming on Thursday morning! Ah, I need to do more marking, but I haven't found a favorite way yet. I love the Clover Chacoliners. They mark with a fine line, the chalk brushes off and you can buy refill tubes. Use a light hand with the yellow or the blue though if you are marking something you are not going to wash like a wall hanging. I also love the Clover Chacoliners, though I trouble with them if the quilt is not all the same color/value. 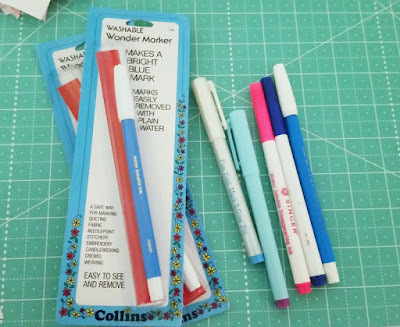 I use the blue water soluable pens the most (I like Clover's) and have not had the issues as in the other post. I keep a water bottle in my sewing room and spray the quilt heavily with water once I no longer need the markings. Since I don't do my own quilting, I don't usually have to mark anything other than the lines for making HSTs. I either use a pencil for that or a white pencil for really dark fabrics.